My breed is very small, mostly from 3to 5 milkers and one buck. I am breeding out from 5 to 10 kids every year. My buck and all my goats are hornless, in spite of it a kid with horns can be born. After years of careful selection I have managed to gain excelent milkers with well-formed udders and orifices approprite for manual milking. Our kids leave for small family breeds after its weaning. Also we sold several our kids to foreign clients within last two years. The Brown Shorthair Goat (H) originates from selective goat breeding in the period of 1900 - 1930 years, mainly in the Czech - German borderland. 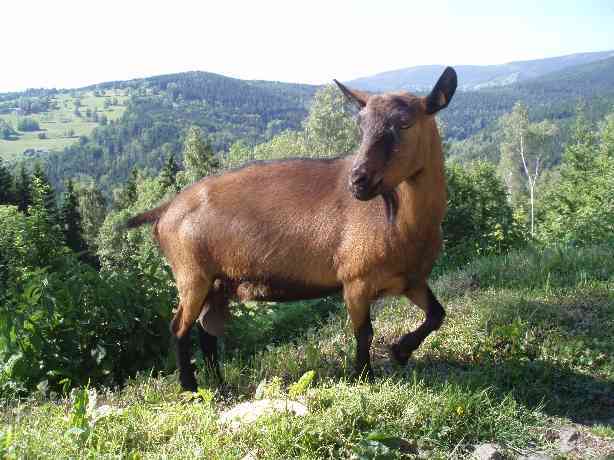 Her ancestors are local, country goats and goats of brown breeds, above all Harz goats, Erzgebirge goats and brown Alpine goats. 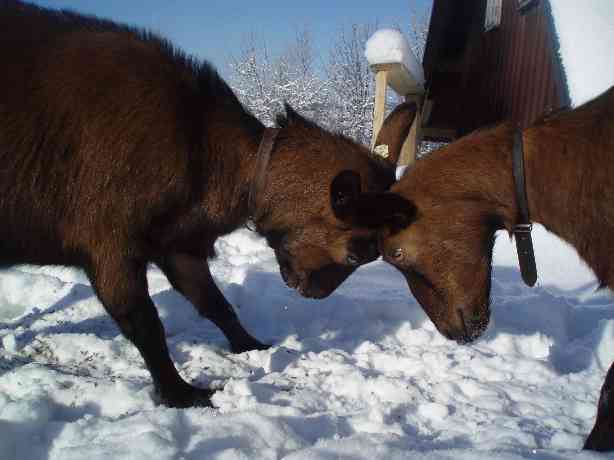 They are medium size animals with strong physique. 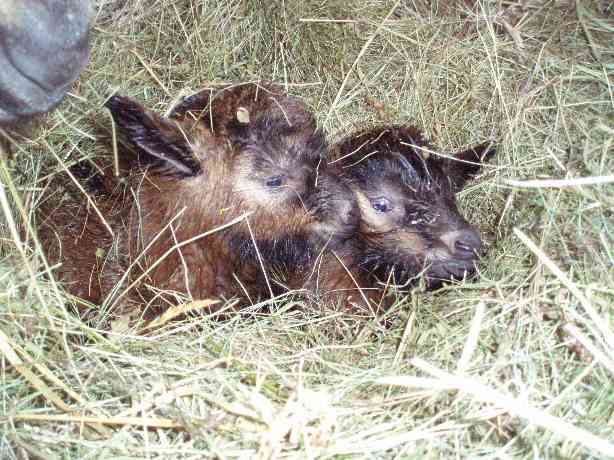 They are hardy, adaptable animals that thrive well in regions with worse climatic conditions. Their basic marking is brown colour with spinal eelstripe. Muzzle, belly, cloven hoofs and upright ears inside are black. They can be with horns or hornless. Weight of bucks is from 65 to 80 kilos (143 – 176 pounds), does weigh from 45 to 50 kilos (99 – 110 pounds). Bucks should stand 70 – 80 centimeters (27.5 – 31.5 inches) at the withers and does 65 – 75 centimeters (25.5 – 29.5 inches). Following seventy years of selective breeding their high milk production was stabilized (in average 800 – 900 kilos (1764 – 1984 pounds) of milk per year, 3.6% milk fat and 2.7% protein). Also important is their high and stable reproduction rate (fertilization average 96% , reproductive ability average 186% and 158% kid rearing ). 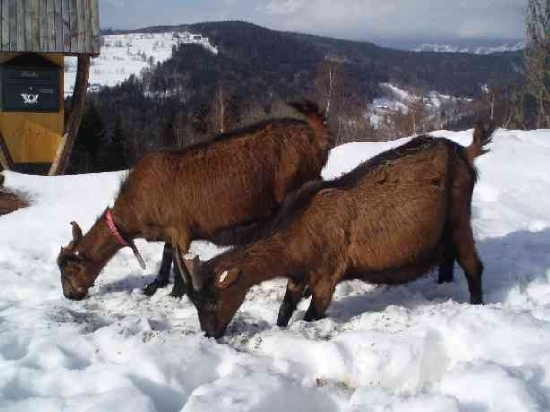 Our goats are living in the Krkonose mountains about 800 metres above sea level. They feed on bushes, weeds and wild, not very good grass during summer. In winter they are sheltered freely in an uninsulated barn. They tolerate freeze up to minus 20 degrees Celsius. All goats are going out every day all the year round. During summer they are grazing on a pasture, in winter they spend all calm days on snow. Kids are usually born early in spring. They manage temperatures slightly under zero. Their birth needs to be monitored (now I have an electrical nurse) and baby goats must be dried by towel as soon as possible. If there is bigger freeze I take new-born kids into my house near the stove for about half an hour to dry them to prevent hypothermia. The H breed is characterized by its early breeding maturity. 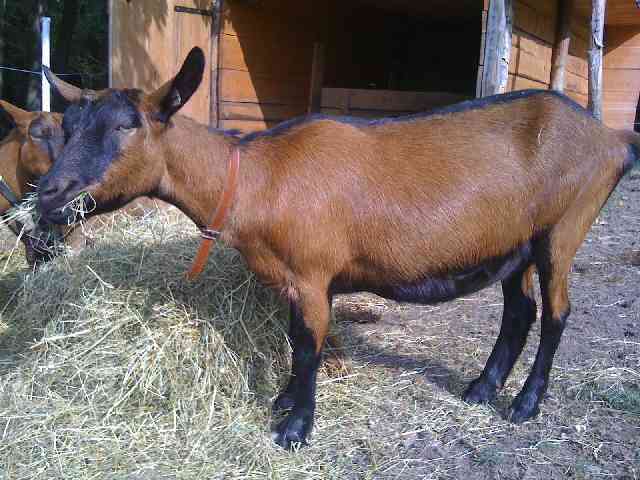 If in good condition young goats are currently first time bred 7 or 8 months old. In this case their weight have to be about 70% of mature animal weight. But we don´t progress so quickly. Our young goats are bred not until they will reach their second year and their weight is about 40 – 45 kilos (88 – 99 pounds). 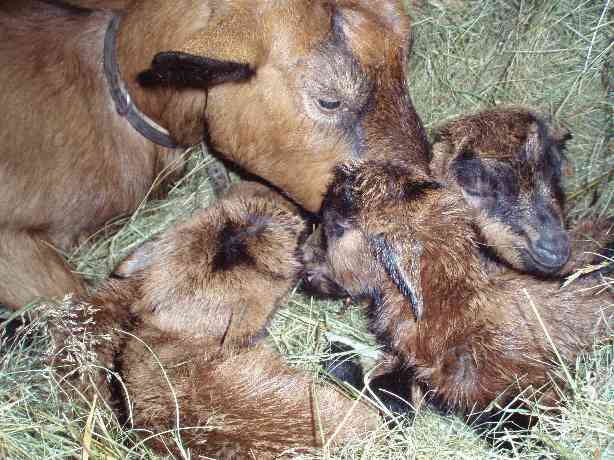 These early goats reach sexual maturation already in their 4th – 6th month. During this time it is important to prevent any contact of the young goats with bucks because there is a possibility of unwelcome premature fertlization. These goats reach full maturity when they are from 15 to 18 months old, their growth finishes in their two years and their life span is about 10 – 12 years. There is 18 – 21 oestrus (heat) cycle for the does and its duration varies from 2 to 3 days. Ovulation starts 36 hours after the doe come into heat. Most of goat breeds have a seasonal breeding that starts approximately 60 – 120 days after the July, 21st. (summer solstice). During the autumn days the daylight period becomes shorter and that signals start of goat´s breeding season. The doe coming into heat is repeated after 19 – 21 days. Average time of the goat´s pregnancy is 152 days but it can be 10 days shorter or longer. To make birth easier we need to provide the goat with sufficiency of quality pasture, free move outside through day and to add grain, minerals and vitamins. Also block of mineral salt must be available. The goats of this breed are excellent and able mothers. Birth complications occur very rarely. Growth and development of kids is not even. At first they grow in height and length. Only when they are about 3 months old, do they begin to grow intensely in depth and width. To accelerate development and growth of young animals by increased additions of grain isn´t good because we can cause problems with their skeletons. Too little feed causes deformed and underdeveloped bones and complete supporting system, mostly limbs. The best method of rearing a kid is natural grazing with its mother. In our breeding we wean our kids usually in their fifth month. Goats are not typical grazing animals. Rather than graze down systematically, they pay rather more attention to seek various kinds of plants to their taste. Especially they like leaves of bushes and trees. They are fond of browsing appletrees. They enjoy ashes, maples, beeches and bilberries growth. They are able to spend all day on banks covered by young sprouts from seedlings. They like raspberry canes that are very healthy for them. I recommend serving them the raspberry canes if they have indigestion. Our goats love their afternoon strolls. They need freedom to move, enjoyment and a possibility to pick various food. Goats spend up to 11 hours daily seeking and consuming food. They are well known by their ability to differentiate among bitter, salty, sweet and sour tastes. They are unusual in the animal world as they seek rather bitter food such as a tree bark.